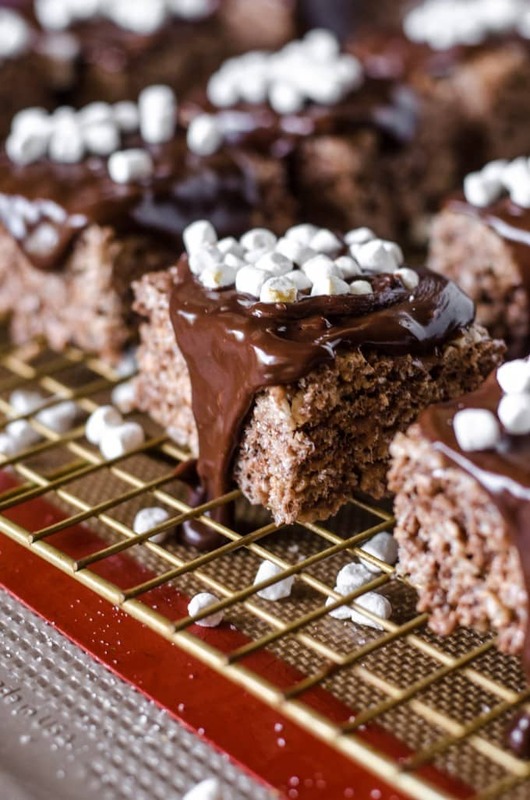 I had the idea for these Hot Chocolate Rice Krispies® Treats months ago. Literally, months ago. Like, July. Clearly, July in Florida is a less than optimal time to make anything that involves hot chocolate. Or the holidays. Or really, just anything hot. 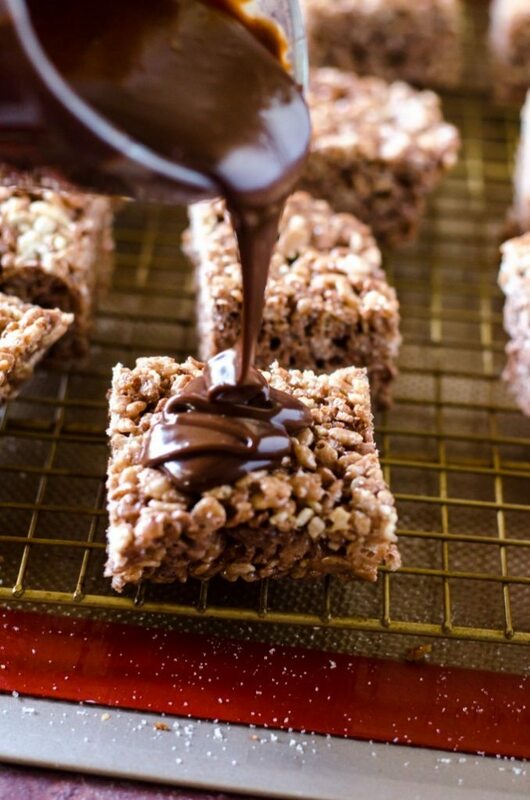 I have always loved Rice Krispies® Treats, although I honestly had never made them until a couple of years ago when I made my Samoa Rice Krispies® Treats. Whenever I had them, they were always the prepackaged kind, usually bought at school. However, once I found out how freaking easy they are to make, I felt like a fool for not making them sooner. When it comes to satisfying a need for a sweet treat, you just can’t beat these- so quick and easy, with only 3 ingredients. Not only that, but they are a blank canvas for innumerable twists to turn them into something new- like my Puppy Chow Rice Krispies® Treats and these Hot Chocolate Rice Krispies® Treats. 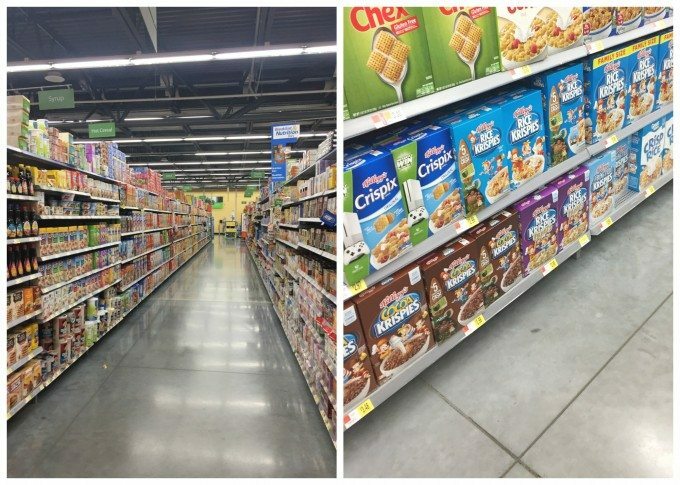 Like I said, I had the idea for these months ago when shopping in Walmart. I happened upon a product I’d never seen before- a container of those little dried marshmallows that they have in the packets of hot cocoa mix. 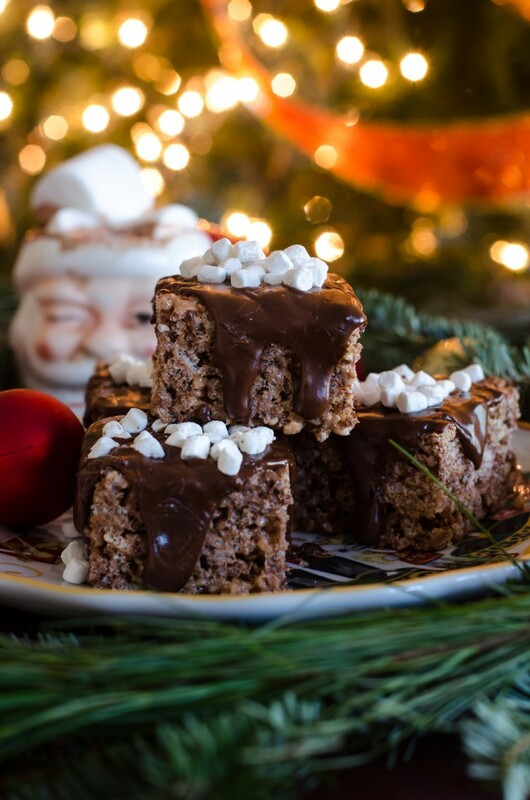 I instantly thought of these- hot chocolate meeting Rice Krispie Treats for the ultimate winter holiday treat! These have a lovely taste of hot chocolate to them, thanks to the addition of hot cocoa mix into the melted marshmallows and a blend of Kellogg’s® Rice and Cocoa Krispies®. 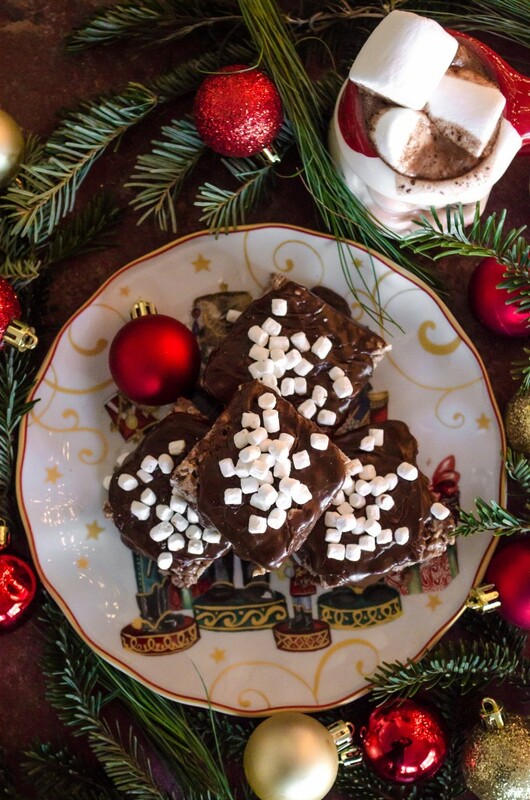 Drizzled with a chocolate glaze, then they are showered with mini marshmallows, reminiscent of a big steaming mug of rich hot chocolate piled high with marshmallows. They are incredible. I gave half of them to my sweet-loving friend, her two sweet-loving daughters and her mega-sweet-loving husband. I got a text later- “These are the best I have ever had!” Pretty much the ultimate gift to me! These are so wonderful for all the treat-making-occaisions this time of year. 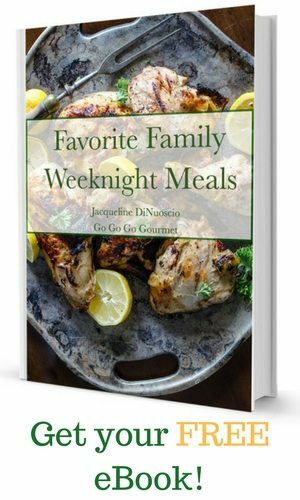 They have a super-short ingredient list and take no time at all to put together, plus you don’t have to use your oven (which means that you can make a few batches of cookies at the same time! The process is simple- even Jonathan helped. 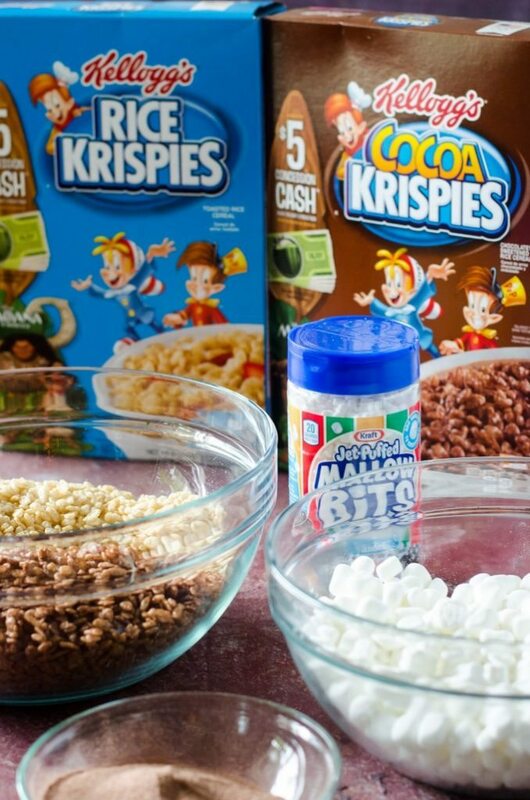 Get more information here- and tell me, what’s YOUR favorite twist on a Rice Krispies® Treat?? 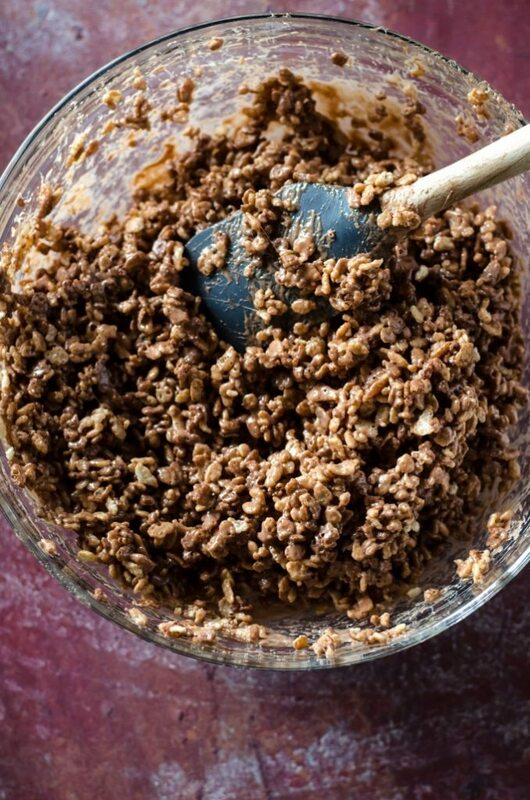 In a large bowl, combine the Cocoa Krispies® and Rice Krispies®. In a separate bowl, add the marshmallows and butter. Microwave in 30 second intervals, stirring after each interval, until fully melted. Stir or whisk in the cocoa mix. Microwave for a final 30 seconds. Immediately pour the marshmallow mixture over the cereal and gently mix until evenly coated. Line a 9x9 baking dish with parchment paper and press the cereal mixture into the pan. Allow to cool for 15 minutes. While the bars are cooling, add the chocolate chips and cream to a microwave safe measuring cup. Microwave in 30 second intervals until the chocolate is fully melted. Lift the bars out of the baking dish and cut into 16 squares. 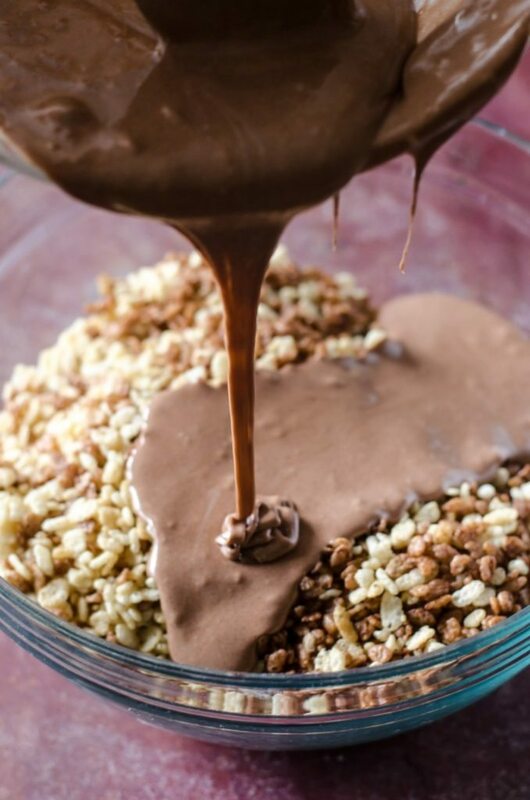 Pour approximately 2 tablespoons melted chocolate over the bars and spread to the edges. Immediately sprinkle with marshmallow bits. Repeat with remaining bars. Merry Christmas to you too!! These was from the “Twas the Night Before Christmas” collection from Williams Sonoma. I bought them two years ago and continue to be awed by their beauty. 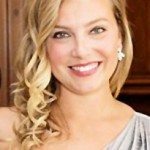 These are the links to what I have: http://rstyle.me/~ad8ys http://rstyle.me/~ad8zr http://rstyle.me/~ad8zu http://rstyle.me/~ad8zD http://rstyle.me/~ad8zM And you have reminded me that I need to go get more for Christmas dinner this year, so thanks!